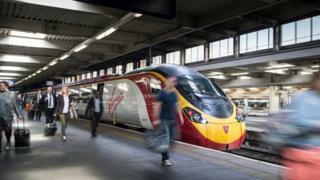 Virgin has become the first train company to automatically compensate some passengers if they are delayed. From Saturday 3 October, travellers using its services on the West Coast mainline - and who book their tickets via the company app or website - will receive automatic repayments. The government urged other train operators to follow suit. The idea follows the announcement that delayed passengers now have the right to compensation in cash. Until this summer, all compensation was paid in vouchers. "Our plan is to make sure passengers across the country benefit from schemes like this, and we are encouraging other operators to roll out similar schemes nationwide," said Transport Secretary Patrick McLoughlin. Virgin train passengers who are delayed will receive compensation back on to the card they used for the purchase. They use Virgin's West Coast Mainline. The scheme may later be extended to include Virgin's East Coast service. Virgin is confident that a delay of at least 30 minutes has occurred. Journeys across multiple operators will not be eligible. However, Virgin said that it expected to pay out an extra £2.8m in compensation in the first year of the new system. At least 3.5m journeys will qualify for possible claims, the company said. Passengers who do not qualify for automatic compensation can still apply in the normal way. But previous research has shown that most passengers do not bother to claim compensation, even when it is due. In 2013, the passenger group Transport Focus said that 88% of those delayed did not apply. The compensation will be on the basis of "Delay Repay", which is offered by around half of all train operators. It is thought that at least one other train operator is now considering offering automatic refunds.